A step through the door takes you back into your favorite Up North memory— the cabin you stayed at in Elberta, fishing in Lake Leelanau, camping on South Manitou or climbing the Sleeping Bear Dunes for the first time. 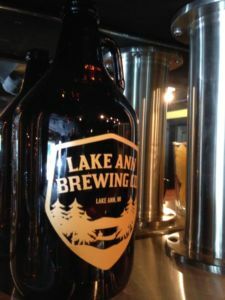 From the Northern Michigan cabin interior to the picnic-table seating out back, Lake Ann Brewing Co. is everything you love about being Up North. While you’re sitting at the bar you’ll notice the sportsman’s thermometer from Grandpa Jack’s house and the antique sign reading “Free Beer! Tomorrow.” It’s details like these that make it an authentic Northern Michigan brewery. Located in the quaint downtown area of Lake Ann, the brewery was originally built in 1945 by Guy Gray and started as the Snack Shack. 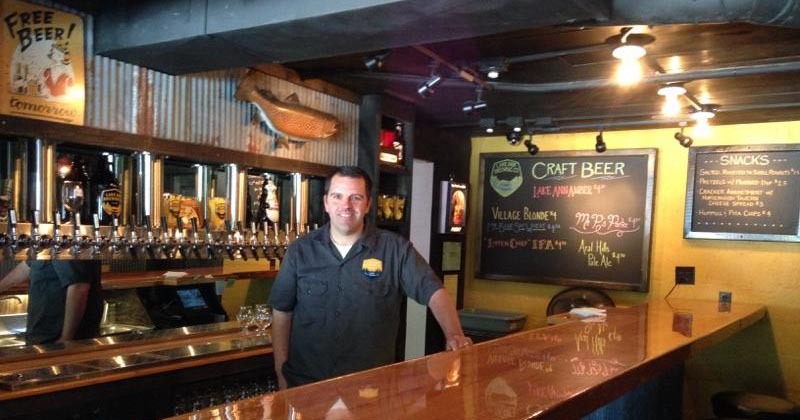 Matt bought the building in April 2014, and after a year of renovations opened the doors to customers on June 16. Matt first moved to Northern Michigan in 1998. He now lives in Lake Ann with his wife Jennie and three children. Beer is one of those things. Matt has been home brewing for almost 20 years, and admits he’s made some terrible brews before, but he’s learned a thing or two since then. Now at his brewery, Matt keeps six of his beers on tap along with wine from Left Foot Charley and cider from Tandem Ciders. Customer favorites include the Aral Hills Pale Ale made with hops from Empire Hops Farm along with the summer wheat ale made with orange and lemon peels and coriander. The “Listen Chief IPA” is Matt’s pick. If you’re in need of some grub, walk 15 feet over to the Stone Oven and bring a pizza and breadsticks or a sandwich with you to the brewery. Their baked mac-and-cheese is also a must try. Lake Ann Brewing Co. is at 6535 First St. Check the brewery’s Facebook page for updated hours and the live music schedule.